I just had to share this with my fellow book lover friends as I am really excited. 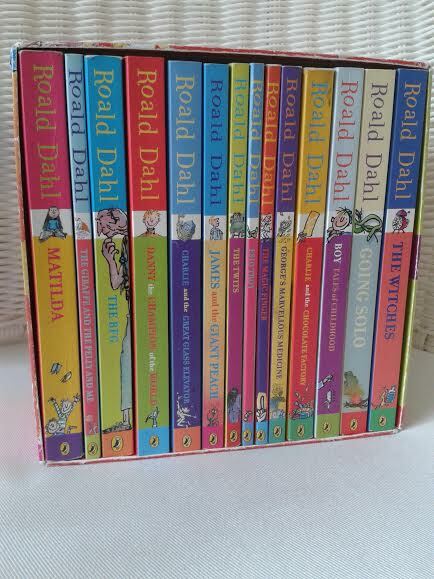 I picked up this 2nd hand Roald Dahl bundle for my *ahem* son 🙂 Yes, they are not at all for me … Lol !!! As a little girl I loved both Enid Blyton and Roald Dahl and unfortunately have none of my old copies anymore. My son is approaching 6 and I am so excited that he is at that stage where he is learning to read and also that we can read some more advanced chapter books for him now. Out of this bundle we have so far read Esio Trot and we all loved it. Normally either myself or my husband will read to our son but Esio Trot drew the 3 of us together and gave us plenty of laughs. Congratulations on your find. What a great discovery! Enjoy! Wow that’s great! I have actually not read anything by Dahl yet but I plan to. Way to go! I actually haven’t read anything by Roald Dahl since watching the film adaptations of both Matilda and Charlie and the Chocolate Factory don’t really count. However, I would be so ecstatic if I owned these!